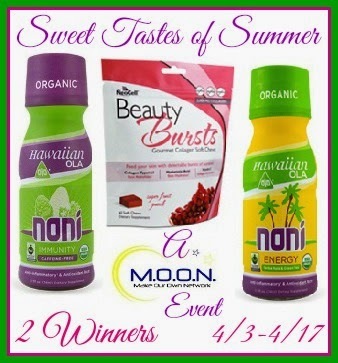 "Noni Energy is made with Yerba Maté and Green Tea contains 75% fruit juice, is organic, GMO-free, and contains only 35 calories in each bottle. The Noni Immunity is caffeine free, with no sugar added, made with Asperuloside (a natural plant non-inflammatory) and Damnacanthal (which has a cleansing and detox affect)." "Having beautiful and radiant skin has never been so easy- or so delicious. NeoCell Beauty Bursts deliver high absorption beauty nutrients in delectable, gourmet soft chews. Collagen Type 1 and 3 is the body's beauty protein and strengthens skin, hair & nails. Hyaluronic Acid is know as "Nature's Moisturizer" & hydrates the skin. Vitamin C is essential to boosting collagen in the skin. Together, these three beauty nutrients work together to build beautiful skin from the inside out." This giveaway is open to the Continental US only (because of shipping costs) and will end on April 17th, 2014. My favorite flavor of summer is fresh fruit salad, loaded with berries and fresh cherries and peaches then tossed with my pineapple honey lime dressing to keep it all fresh. Yum! I love mangoes, they are summer in a fruit to me ! !